"The Casey Jr. train is also waiting for you to climb aboard for a thrilling trip over hill and dale." For the engine's name, Joe Grant and other artists turned to The Ballad of Casey Jones, by African-American railroad worker Wallace Saunders. The epic poem told the true story of the death of engineer Jonathan Luther "Casey" Jones in 1900, who bravely stayed aboard a doomed locomotive to minimize the effects of an inevitable crash. (Full disclosure: I have a nephew named Casey Jones.) The new character in the Disney version became Casey, Jr. (voiced by Margaret Wright). Dumbo (1941) was unusual in that it received less of Walt Disney's time than other films and, at 64 minutes, the finished film was shorter than most feature-length films. A ride on the circus train from Dumbo was a natural as Bruce Bushman and others brainstormed ideas for Disneyland based on Disney films, and a miniature train had been one of the earliest elements. 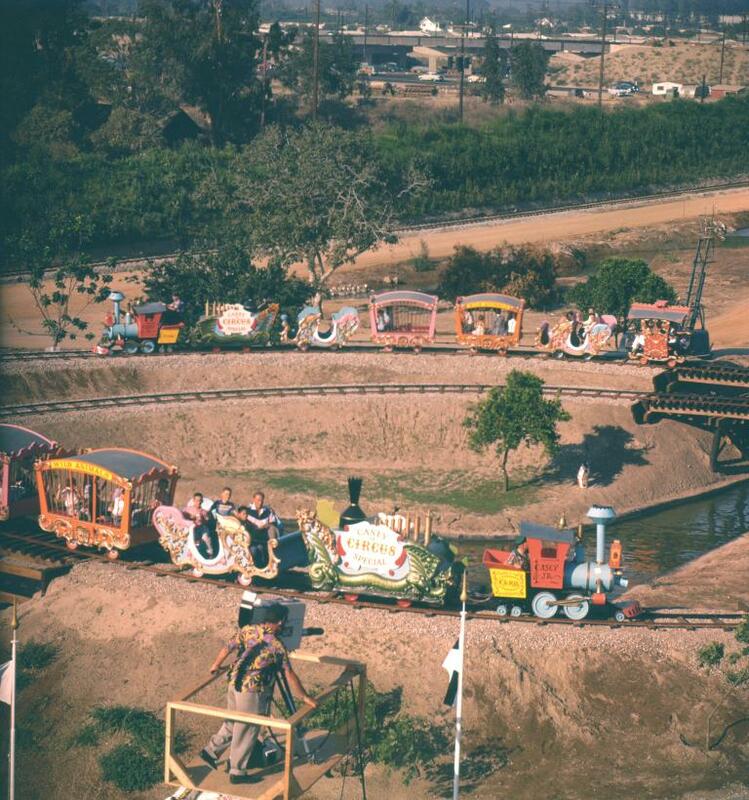 In September 1953, a Lilliputian Land was imagined that would include a "Miniature Train & Canal Ride." As the plans evolved and Lilliputian Land was subsumed into Fantasyland, the miniature train was not to be just a level tour, but would include the "I think I can" hill, not unlike a roller coaster. The compact track layout might have been borrowed from Model Railroader magazine, designed to twist a long track into a small space. 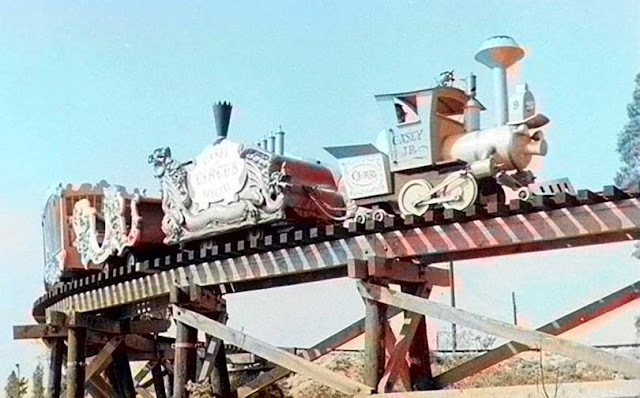 Bushman worked with ride manufacturer (and carrousel refurbisher) Arrow Development to design the 30-inch gauge railroad. There would be two identical trains with five, six-passenger cars each. Motive power would come from a six-cylinder automobile engine. 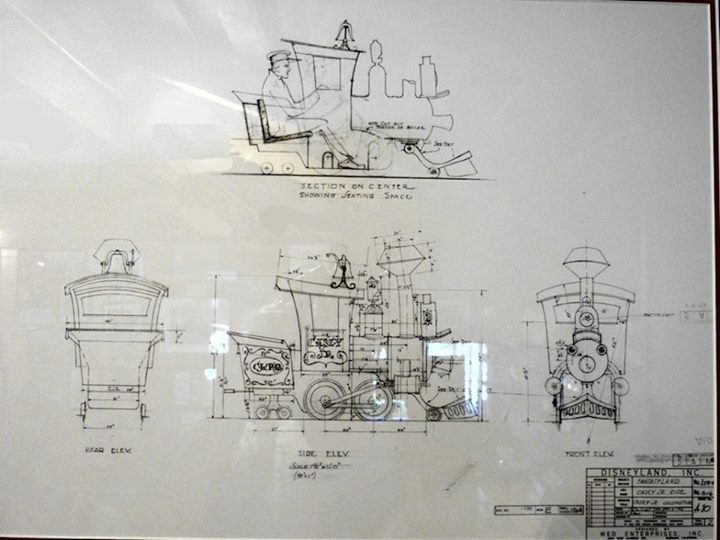 Bushman designed a caricature locomotive and tender, neither of which could accommodate the engine, so a boxy "calliope" car was added behind the tender to house the engine. A typical roller coaster of the day used a chain lift, but the engineers at Arrow innovated sprockets on the train that engaged with a fixed chain on the hill, like a cog railway. Most roller coasters have no power on board, but this train would use its engine to climb the steep incline. The chain eliminated worries about traction in the rain. As the televised preview date neared, a problem revealed itself. 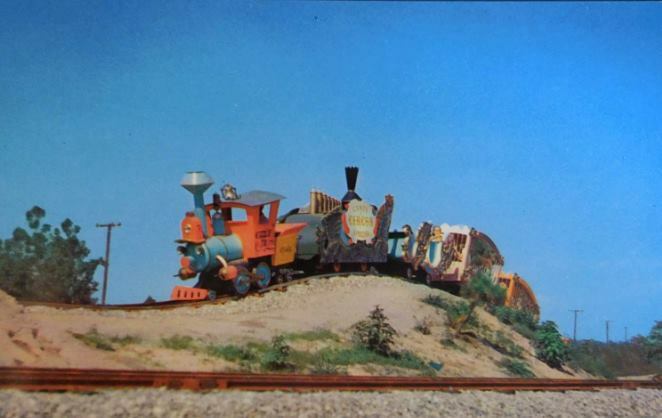 The "I think I can" hill was so steep that the lightweight prop locomotive had a tendency to flip over backward. The calliope car, with its heavy engine, had the weight to stay on the track, but the locomotive and tender did not. Arrow engineers Ed Morgan and Karl Bacon determined that they could keep the locomotive on the track if they were careful about the train's momentum approaching the hill. Morgan and Bacon explained the situation to comedian Jerry Colonna, who was supposed to drive the train on television for the Dateline: Disneyland broadcast. For some reason, the world-famous performer was unwilling to risk death on the brand new ride. Colonna didn't Think He Could. With only minutes to spare, Karl Bacon put on Jerry's engineer costume and waved to the camera as the announcer called him Jerry Colonna. The engine was housed in the calliope car. The solution was not more weight in the locomotive for better traction, but rather the installation of wheels that would roll under the track to make uplift impossible. Bacon and Morgan used a similar invention on the Matterhorn Bobsleds four years later. The ride's opening was delayed for a couple of weeks as welders installed the modification and they were tested. The Casey, Jr. Circus Train cost a reported $50,000 in 1955. Jim Hill reports that the ten passenger cars—four chariots, four cage cars, and two cabooses—cost $1,550 per car, plus 3% tax = $15,965. The 1,840' (561 m) track was a large-scale model train layout, with figure-eight turns, parallel straightaways and over-and-under tunnels and bridges. The rails were ultra-narrow gauge at 30" (762 cm) with a minimum turning radius of about forty feet (12 m). 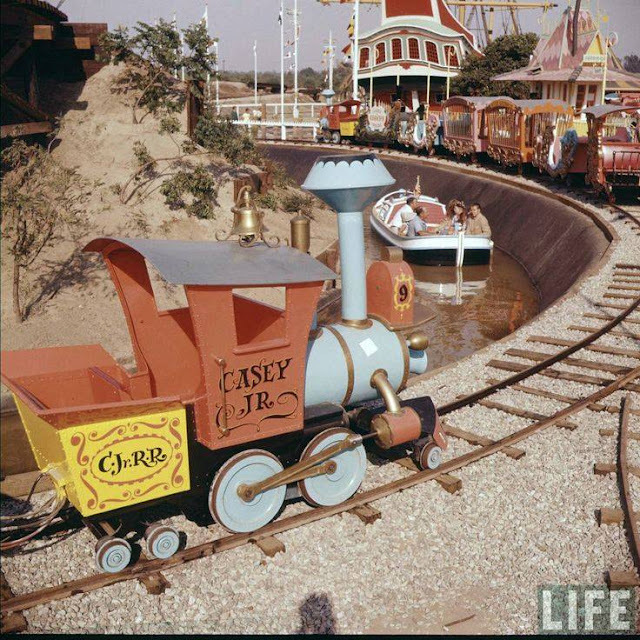 Casey Jr. is one of a small number of 1955 rides still in operation. The train uses more environmentally-friendly fuel now, and there have likely been engineering improvements made over the years, but the track layout has not changed in 63 years. Casey Jr. trains on July 17, 1955 (note television camera in foreground). Arrow Development Bruce Bushman Casey Jr.
Labels: Arrow Development Bruce Bushman Casey Jr.